Two of the nine EU core network corridors, established with Regulation 1316/2013, cross the territory of the Republic of Bulgaria. 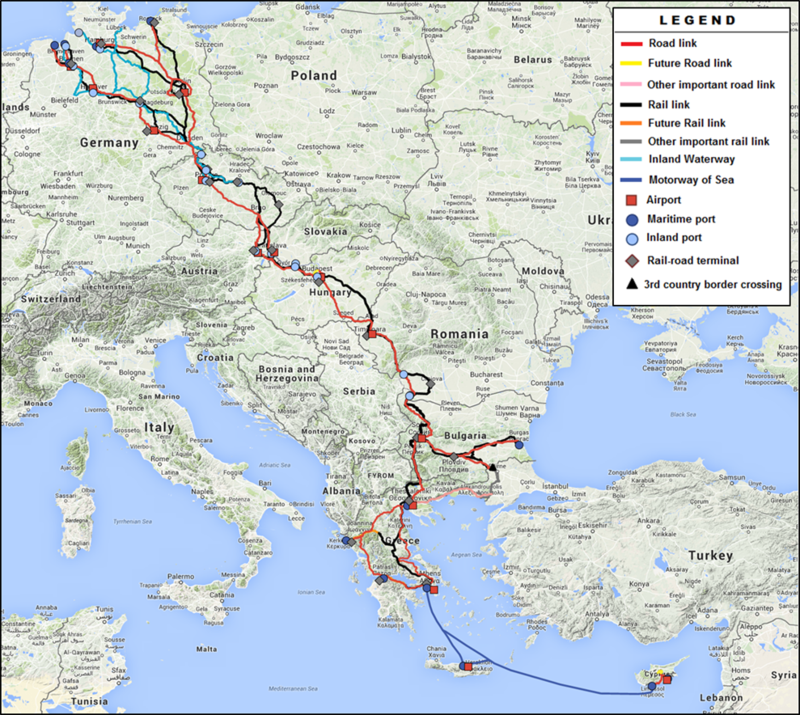 The Orient/East-Med Corridor connects Bulgaria with 8 other EU countries (Germany, Austria, Czech Republic, Hungary, Romania, Slovakia, Hellenic Republic and Cyprus). On Bulgarian territory it includes railway and road route along the directions „Vidin – Sofia – Kulata” and “Sofia – Plovdiv – Burgas/Svilengrad Turkish border”, as well as ports of Vidin and Burgas, Sofia Airport and Intermodal Terminal Plovdiv. The Rhine-Danube Corridor connects Bulgaria with France, Germany, Czech Republic, Austria, Croatia, Slovakia, Hungary and Romania. On Bulgarian territory the corridor includes the Danube River, ports of Vidin and Ruse, as well as Intermodal Terminal Ruse. The sea ports of national importance Varna and Burgas are situated on the Black Sea. Their combined quay front has a total length of 13 081 m, where 69 freight, 8 passenger and 11 service berths have been separated. The total capacity is approx. 60 mln. t/y. Both Varna and Burgas have railway connection. All the river ports of national importance (Vidin, Lom, Oryahovo, Somovit, Nikopol, Svishtov, Ruse, Tutrakan and Silistra) are located along the Danube River. Their combined quay front has a total length of 9 080 m, where 44 freight, 5 RO-RO transport, 14 passenger and 3 service berths are separated. The total capacity is approx. 13 mln. t/y. Ports of Vidin, Lom, Somovit, Svishtov and Ruse have railway connection. In addition to the ports with national importance, there is a number of ports of regional importance. The quay front of the sea ports of regional importance is 1748 m, along which 13 freight and 6 passenger berths are separated. Their combined capacity is approx. 3,5 mln. t/y. The quay front of the river ports of regional importance has a total length of 4 964 m, where 30 freight, 2 Ro-Ro transport, 3 passenger and 12 service berths are separated. Their combined capacity is approx. 9,5 mln. t/y. The total length of the road network is 19 853 km, including 724 km motorways, 2 954 km first class roads and 16 165 km second and third class roads. The total length of the railway network is 6 474 km, including 2 908 km single track lines, 1 978 km double track lines, 1 436 km service siding tracks and 125 km lines with 760 mm gauge.